Elevated Levels Of Suspected Carcinogen Found In States' Drinking Water A chemical widely used to make many water-resistant and nonstick items can be found in many community water supplies. But elevated levels of PFOA are turning up in three Northeastern states. The village of Hoosick Falls, N.Y., sits along the Hoosick River in eastern New York. Elevated levels of a suspected carcinogen known as PFOA were found in the village's well water, which is now filtered. Water safety concerns aren't just in Flint, Mich., these days. Communities in three states in the Northeast have found elevated levels of a suspected carcinogen — perfluorooctanoic acid, or PFOA. Used to make Teflon, the chemical has contaminated water supplies in New York, New Hampshire and Vermont. After a four-month ban in the village of Hoosick Falls, N.Y., the New York State Department of Health declared the water safe to drink and cook with again on Wednesday. A temporary filtering system has brought PFOA levels down to nondetectable levels for weeks. But Michael Hickey isn't rushing to turn on his kitchen faucet. It's been more than two years since he has drunk from the tap. Since late November, he and more than 3,400 of his neighbors in Hoosick Falls have had another routine — stopping at the local supermarket almost every day to pick up free rations of bottled water. For Hickey, this saga began after his father died from kidney cancer in 2013. "I'm not a big environmentalist," he says. "I'm just an everyday guy that came across a chemical that I felt the need to follow through on for my father and my son." His father worked with PFOA, also known as C8, at a plastics factory that made Teflon products near the village's wells. Hickey wondered, was there something in the water? He paid to have water samples tested for PFOA. Results showed levels higher than the Environmental Protection Agency's recommendation of 400 parts per trillion, a provisional health advisory. Follow-up tests found levels 45 times higher than that — at 18,000 parts per trillion — near the factory. Then, last November, the EPA told Hoosick Falls residents to stop drinking the water, and Saint-Gobain Performance Plastics, the factory's current owner, agreed to pay for a filtration system and bottled water for residents. "It didn't have to be this way. This is a beautiful little town. It's heartbreaking," says Kathleen Reece, who has lived in Hoosick Falls for more than a decade and has been taking shorter showers with the filtered water. Stew Brodell takes a sample of soil near a private well that was contaminated with PFOA in North Bennington, Vt. 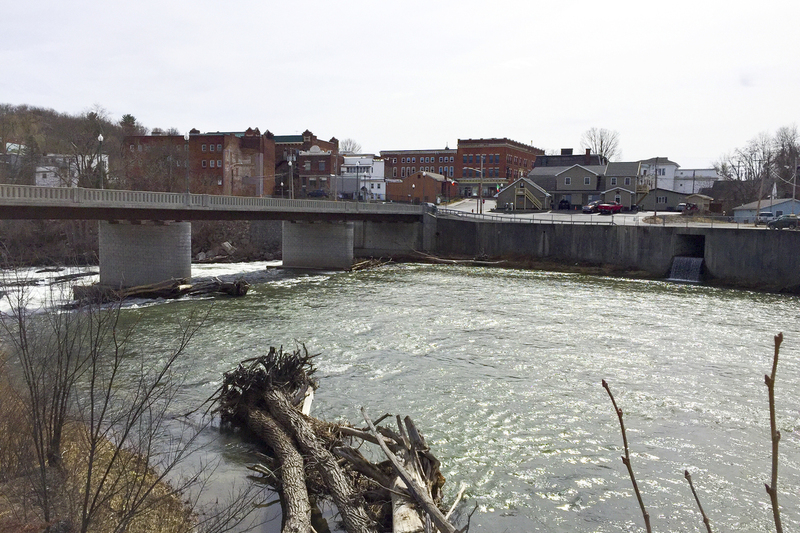 In North Bennington, Vt. — a short drive across the New York border from Hoosick Falls — tests found PFOA in private wells near a former plastics plant once owned by Chemfab and later Saint-Gobain, though not in the town's municipal water supply. 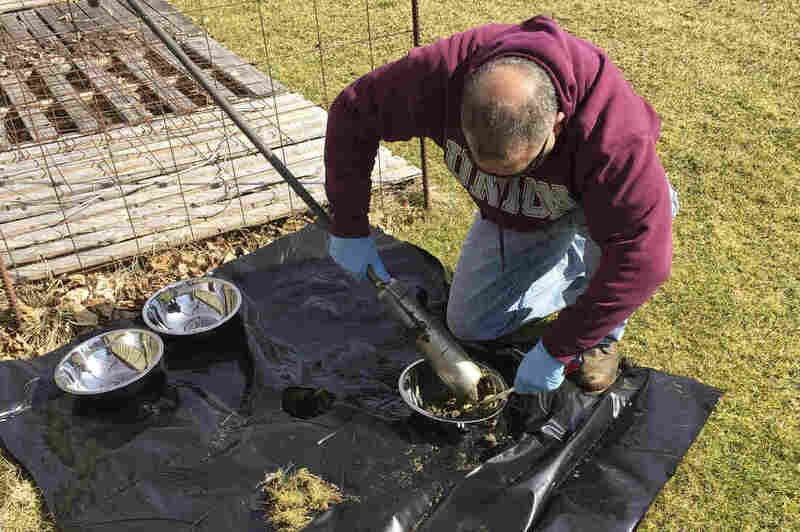 Soil testers recently sampled dirt from homes with PFOA levels higher than the Vermont Department of Health's standard of 20 parts per trillion. "Once we started getting drinking water results, people were like, 'Well, what about our gardens? What about the soils around our homes?' " says Richard Spiese, who is overseeing the tests for the Vermont Department of Environmental Conservation. Those are just some of the many questions that government officials are scrambling to answer — and they're playing catch-up. PFOA has been around for almost 70 years. For decades, it was used to make nonstick pans, stain-resistant carpets and even microwave popcorn bags. A study by the Centers for Disease Control and Prevention detected small amounts of PFOA in the blood of more than 98 percent of Americans. 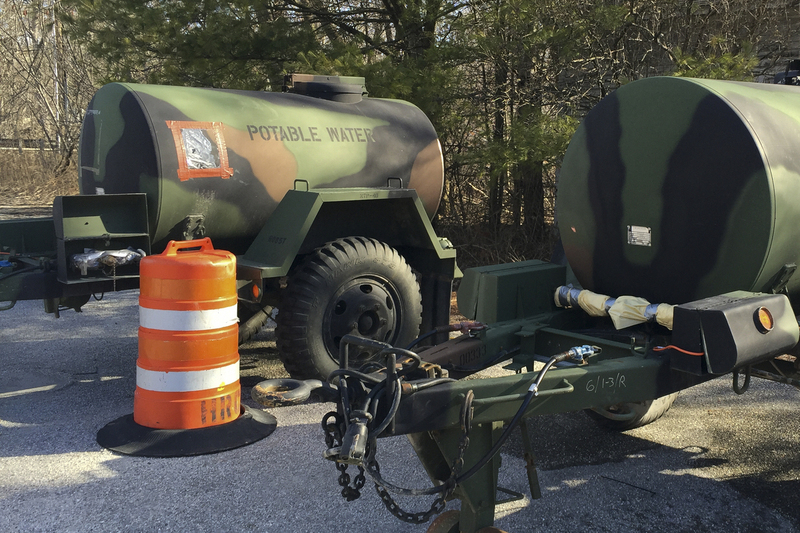 Residents with PFOA-contaminated wells in North Bennington, Vt., can fill jugs with potable water from "water buffalo" tanks stationed across from a former plastics plant. "It stays in the body for many, many years, and it turns out to interact with processes in our body," explains Philippe Grandjean, a professor of environmental health at the Harvard School of Public Health. His research on PFOA has found it can interfere with children's immune systems and make them less responsive to vaccines. Other studies have shown a "probable link" between the chemical and some types of cancer. DuPont, 3M and other companies have been sued for contaminating water with PFOA in West Virginia, Ohio and Alabama. The EPA has pushed companies to clean up contaminated sites, and many manufacturers in the U.S. have stopped using the chemical. Grandjean is concerned that PFOA's presence may be more widespread than initially thought now that the Pentagon is investigating the water at 664 military sites that used firefighting foams and may be contaminated with it and other perfluorinated chemicals, or PFCs. "This is not just a local problem. This is a problem which I am sure occurs in every single state," he says. That's the same message the governors of New York, Vermont and New Hampshire sent to the EPA in March. In a joint letter, they wrote that PFOA contamination is "a national problem that requires federal guidelines and a consistent, science-based approach." Still, there's a lot researchers don't understand about PFOA. "We don't know how it moves. We also don't know what concentrations really are going to incur a health risk," says Janet Foley, a chemistry professor at Bennington College, where she co-teaches a class about how the chemical interacts with the environment. Foley adds that PFOA is not unique: There are a lot of other industrial chemicals we don't know much about. "We're so interested in making lots of new stuff. In order to do that, it needs many, many different kinds of chemicals," Foley says. "It's unlikely that they're going to be tested. A lot of times we don't know the questions to ask." The question now is, exactly how much PFOA is safe to drink? The EPA has been trying to answer that question for years. Currently, there are no enforceable regulations from the federal government. To set those standards, the EPA says it needs more research on how PFOA impacts humans. But the agency can set new recommendations, and it's working on them now.